The club itself provides you with a 375 ml bottle of balsamic vinegar every month. This vinegar has always been aged for 18 years. You'll receive a dark balsamic vinegar some months and a white balsamic vinegar other times. That's not all. Each shipment provides history about the vinegar and information about using it. There are even some bonuses included, such as a salt, oil or spice that pairs well with the vinegar. The club starts out at $125 for a 3-month subscription. A 6-month subscription is $250, so you're paying the same monthly price regardless of your choice. This club provides you with olive oil and balsamic vinegar every month. 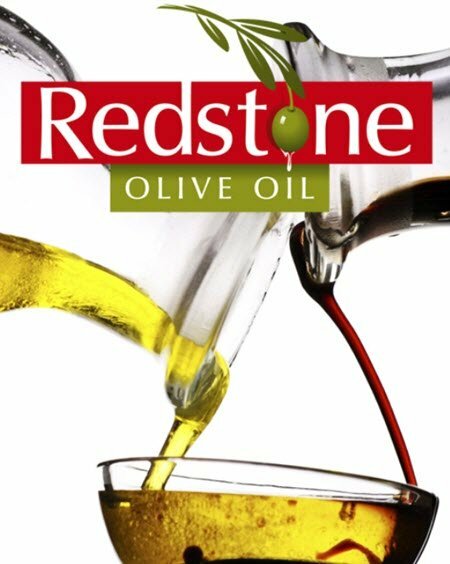 Redstone Olive Oil offers the common combination of balsamic vinegar and olive oil every month. The 2 products do naturally complement each other, so subscriptions like this are always popular. The chosen balsamic vinegar is imported from Italy, giving you selections that you wouldn't find locally. The olive oil comes from a variety of locations and perfectly complements the olive oil. There are 2 membership sizes. The first provides 2 x 60ml bottles of balsamic vinegar and the same of olive oil. The other provides a 200ml bottle of each type. In either case, you pay $45 per month for a 4-month subscription, $43 per month for an 8-month and $40 per month for a 12-month. 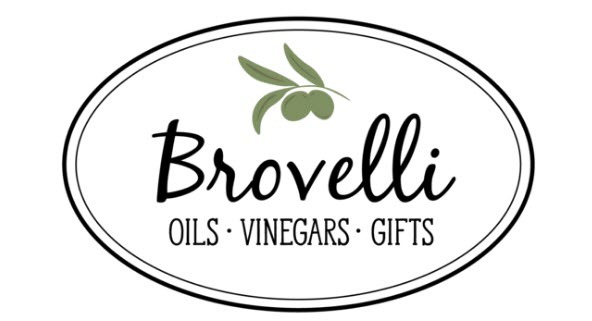 Brovelli is another club that pairs olive oil and balsamic vinegar. The club from Brovelli is a fun choice if you like flavored products. Their previous pairings list highlights many interesting flavors, like Chocolate Espresso Barrel Aged Balsamic Vinegar and Spicy Sriracha White Balsamic Barrel Aged Vinegar. These certainly aren't the typical balsamic vinegars that you'd find in a grocery store. There are 4 versions of the club to choose from. Primo provides a 100ml bottle of olive oil and a 100ml bottle of balsamic vinegar for $18.95 per month. Mezzo offers 250ml bottles for $32.95 each month. Ultimo increases this again, providing 500ml bottles for $71.95 per month. The final option is Estremo. This impressive membership provides a 750ml bottle of oil and the same of vinegar in each shipment. You're paying $81.95 per month. This club provides 10-ounce bottles of balsamic vinegar and olive oil. Chef's Emporium has a strong focus on cooking. This can be seen in their club too – as the company provides a recipe with each shipment. They also say that the 10-ounce bottle size is perfectly suited for cooking. Unfortunately, there are no details about the types of vinegar and olive oil that you can expect. There isn't any pricing information either. The only clear aspect is that there is a 3, 6 and 12-month version of the club. To learn more, you'd need to call the company and talk to them directly. This club offers plenty of subscription lengths to choose from. The club from South Philadelphia Cardenas Taproom provides more support for short-term subscriptions than normal. You're able to order month-to-month or join a 3-month or a 6-month subscription. There's also a quarterly version, which ships out products 4 times per year. In all cases, you're paying $39.95 per shipment. Oddly enough, the site doesn't say how large the bottles are each month or the styles of olive oil and vinegar that are chosen. Images on the site show 375ml bottles and include examples like Fig Balsamic Vinegar and Torretta Italian Extra Virgin Olive Oil. You're likely to find similar products in your subscription. This company follows the familiar style of pre-paid subscriptions that contain olive oil and balsamic vinegar. Gusto Della Vita Gourmet is a fairly typical company in this field, offering the standard selection of 3, 6 and 12 month subscriptions. Their featured balsamic vinegars include chocolate cherry, mixed berry, honey ginger and more. There is also a monthly newsletter with recipes, discounts and articles about oil and vinegar. As for pricing, the 3-month version costs $89, the 6-month costs $175 and the 12-month costs $350. These prices represent a 10%, 17% and 15%, respectively, discount on the regular price for the bottles. While the service sounds appealing, the company is smaller than many others on this list. The website is also lower quality and there are some spelling errors on the sales page. The club could still be fantastic, despite these issues. Nevertheless, the problems do suggest a need for caution. This club allows you to choose whether you want olive oil, balsamic vinegar or both. 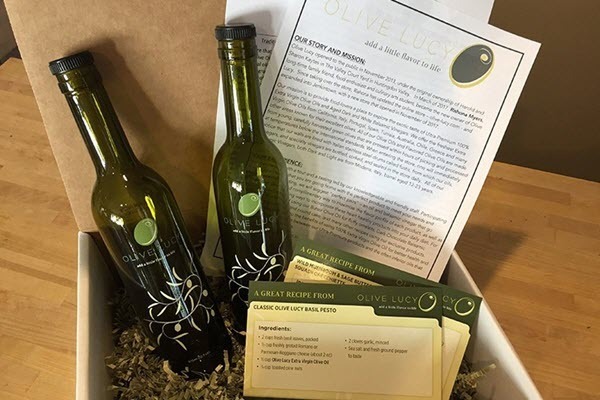 The subscription club from Olive Lucy ships out 2 x 375ml bottles each month. There are 3 versions to choose from, which each focus on different bottles. The most interesting is the Balsamic Vinegar of the month club. This provides you with a bottle of dark balsamic vinegar and a bottle of white balsamic vinegar each month. Recipe cards and product information cards are also included. Alternatively, you could receive a bottle of balsamic vinegar and a bottle of olive oil each month, or 2 bottles of olive oil. The pricing remains the same in all situations. You end up paying $150 for a 3-month subscription, $199 for a 4-month or $299 for a 6-month. You can select your starting month too. This company claims to have especially amazing products. Urban Olive Oils & Balsamics has a strong quality focus. They claim that their products will be the thickest and smoothest balsamic vinegar you've ever tried (within the $5 to $50 range). The vinegar is imported from Modena, Italy – so you know that it's going to be good. There are 3 versions of this subscription too. These all offer 2 x 12.7-ounce bottles. You can choose to get 2 bottles of balsamic vinegar, 2 of extra virgin olive oil or 1 of each. The pricing is the same regardless of which option you choose. Membership options are for 4, 6 or 12 months. These average at $45, $41 and $39 per month, respectively. You also receive simple recipes that make use of the oil and vinegar, along with discounts on products from the company. With this company, you're receiving 500ml bottles of balsamic vinegar and olive oil. 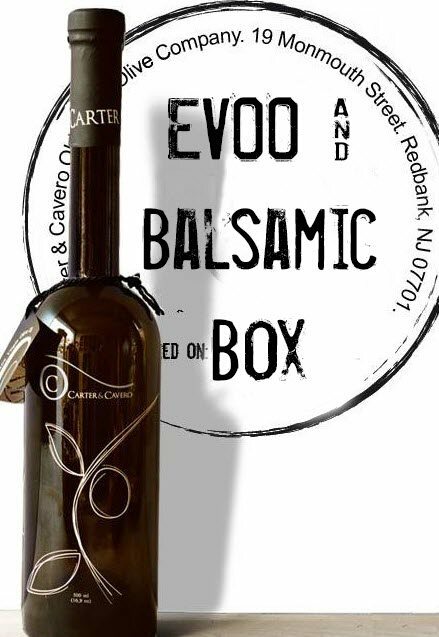 A subscription from Carter and Cavero sends out a 500ml bottle of balsamic vinegar and a 500ml bottle of olive oil in each shipment. You can choose between getting shipments every month or every second month. In either case, you're paying $49.95 per month. You also get an extra 60ml olive oil or balsamic vinegar sample. The sample is always one of the most popular products from the company. Further details aren’t provided, so the sample is likely to be a surprise (which isn’t a bad thing). Carter and Cavero doesn't provide further details about the club. It isn't clear what type of balsamic vinegar you can expect or where this is sourced from. This company provides details about the precise items that you'll receive each month. O'live a Little offers clubs that ship 4 times a year (for $96.95), 6 times a year (for $138.95), 8 times a year (for $190.95) and 12 times a year (for $277.75). 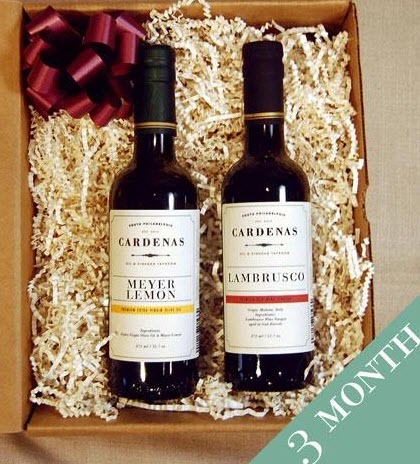 Regardless of the membership, you receive a 375ml bottle of olive oil and the same of balsamic vinegar each month. There is an unusual feature too. O'live a Little provides details about the individual oils on their site. This allows you to see the exact products that you can expect each month. Few other companies provide this information.